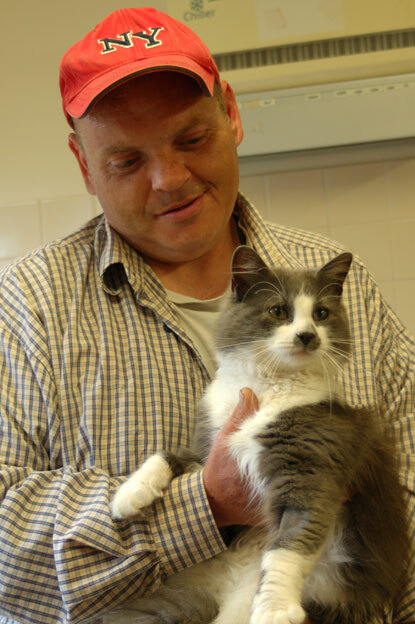 When Shane rescued a poor moggy from a horrific attack, he gained a feline friend that turned his life around. Shane had a tough start in life. Growing up in care, he suffered abuse that caused him to become shy, withdrawn and develop a stammer in his older years. He found it difficult to build relationships with others, and problems with alcohol and drugs meant he led a very chaotic lifestyle. After moving into shared housing, Shane found himself living alongside drug users and would shut himself in his small room, struggling with his mental health alone. Then one day, his whole life changed. Hearing a loud banging from the room next door, Shane went to investigate and was horrified to discover a small bundle of grey and white fur being used as a football. The poor, terrified kitten had followed his neighbours home and was being kicked and punched around the room for their cruel entertainment. Angered by this abuse, Shane ran in and grabbed the innocent cat, taking it back to the safety of his room. He named it Baby, thinking it was a girl, and decided to care for the cat to protect her from any more cruelty. Since he took Baby in, a homeless charity with support workers has helped Shane move into social housing, complete with a communal garden that’s perfect for a cat to explore. Although the landlord has a ‘no pets’ policy, they’ve made an exception for Baby because of the way this wonderful cat has helped to transform Shane’s life for the better. Shane suffers with severe epilepsy and before Baby arrived he was having five to six seizures a week. However, now he has a purring kitty to keep him calm, this has reduced to just one or two a week, making a huge difference to Shane’s quality of life. Shane is also now trying to quit drinking and smoking for good so he can be fit and healthy for his beloved moggy companion. 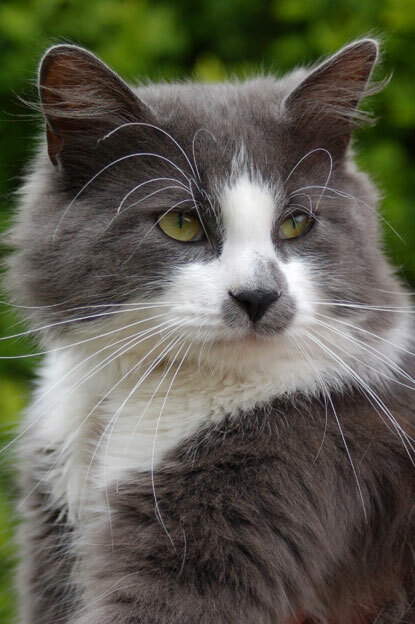 After finding out about Baby, Shane’s support worker contacted their local Cats Protection branch to see if they could give him some financial assistance with neutering and offer advice on how to care for his new feline friend. The Telford & District Branch were more than happy to help and offered to fund Baby’s neutering and microchipping. A trip to Haygate Veterinary Centre soon revealed that Baby was in fact a boy, and after a thorough check-up he was found to be 100% healthy. When Baby returned home from the vets, Cats Protection also helped kit him out with everything he needs, including bowls, a litter tray, a scratch post and toys. The branch also gave Shane some helpful tips on how to care for him, including that as much as Baby may love Marmite on toast, it’s really not what he should be eating! 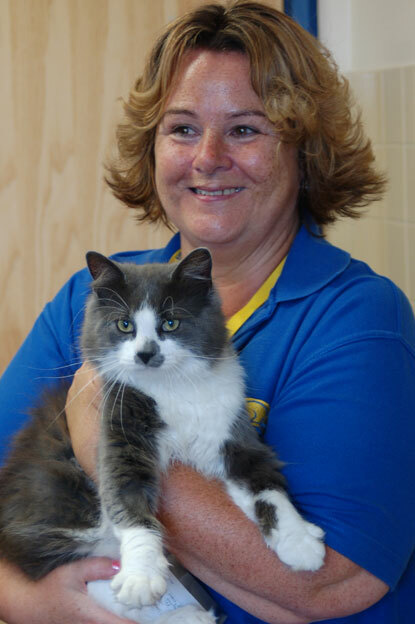 Tracy, Neutering Officer for Telford & District Cats Protection, said: “Baby now has all he needs to thrive in his new home. We have given Shane our leaflet on the five cat welfare needs and he has stuck it up on his wall to help him remember how to care for his new pet. He was so grateful for all the help we were able to provide and has even given us a lovely thank you card. After learning how to make sure Baby stays happy and healthy, Shane was keen to sign up for Haygate Vets’ Healthy Pet Club, a subscription service that covers pets’ basic health care. Unfortunately, as Shane has no personal ID, birth certificate or bank account, he is unable to sign up until he gets his paperwork in order, but after hearing Baby’s story, the vets stepped in to help. They’ve now launched an annual award, giving one deserving cat or dog a year’s free membership to their club, and Baby has been chosen as the first winner. Heartwarming soul-food news of the day. Well done Shane, you are a hero. Because of you, Baby will be safe always. Thank you to CPL and the vet practice (name to credit?). This is humanity at it's best. Hug Baby from me please Shane. Good luck on your journey through some challenging times. You have the heart and soul, you'll do it! Hoping that Shane will continue to improve his life with the help of this wonderful cat. It is good to know that the presence of the a calming influence has helped make his health more controlled. Good luck to them. God bless you Super Shane, for saving your little Baby. It was meant to be. Animals give so much love and trust and deserve it back. I wish you both a long, happy, healthy life together. Never be without animals. They are little angels. So happy you jumped in and saved him...They will get their own karma. Good luck and all the very best to you on yr journey in life, you have done just wonderful!!!! And he's absolutely gorgeous.....The love they give back is immeasurable! Keep up the good work Shane, Baby needs your love and protection. thank you to everyone who helped Baby and Shane have a life.